The Confessor AKA "The Good Shepherd" is a well-acted drama. 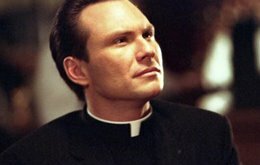 Father Daniel Clemens (Slater) has uncovered a murder mystery involving other priests and corruption in his church. Can he uncover the truth? Christian Slater puts in a good performance as usual. Parker also holds her own. The mystery is a little uneven and the ending is weak, but overall the movie is worth seeing. It goes in too many directions. The director made another movie called Gone Dark (2003) which is a hidden gem. The Confessor is decent little mystery if you don't take it too seriously.